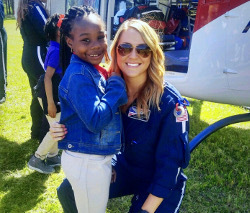 In April 2018, the Milledgeville, Ga., Air Evac Lifeteam crew visited a local elementary school for career day. It was there that flight nurse Britta Thomason was reunited with 7 year-old Carlie. Carlie was struck by a pickup truck that day when she was walking down the road with a family member. Britta and flight paramedic Andrew Strickland climbed into the back of the ambulance and immediately noticed Carlie’s injuries. The Air Evac Lifeteam crew and the Washington County EMS crew worked swiftly to load little Carlie onto the helicopter. Once on board and en route to the hospital, Andrew and Britta administered medication to make their young patient comfortable. They also intubated her. Just 26 minutes after leaving the scene, the Milledgeville crew arrived at Navicent Health in Macon, where the Pediatric Trauma team took over Carlie’s care. Carlie was diagnosed with a traumatic brain injury, fractured facial bones, broken ribs and severed nerves in her left arm. She was transferred to Children’s Healthcare of Atlanta where she remained in a coma and on a breathing machine for the next two and a half weeks. She spent two more months in the hospital, enduring a six-hour facial surgery, a skin graft to her left arm, and placement of a tracheostomy. Finally, after another month of physical therapy, Carlie was released back home! Seven months after seeing Carlie critically injured in the back of an ambulance, the crew that helped save her got to meet her again on a sunny April morning at her school’s Career Day.